I've been on a serious popcorn kick lately. It all started when I visited my parents in July, and attended the local farmer's market with my mom. The market was tiny compared to the Ferry Buliding farmer's market that I'm used to. The produce was fine, but nothing spectacular. Overall, it seemed pretty forgettable. And then my mom mentioned that she needed to get her "treat": a lemonade and a bag of popcorn. She lead me to a stand where they were making fresh kettle corn. It smelt great, but it was just popcorn, how exciting would it really be? While we waited for her lemonade to be freshly squeezed, I idly took a handful of the fresh popcorn. It was salty. It was sweet. It was totally and completely addicting. I couldn't stop eating it. I haven't found kettle corn as good as that stuff anywhere else. I've tried tons of popcorns, from packaged ones, to microwave ones, to fancy ones sold at the farmer's markets here. None even come close to that popcorn. The good news is, it freezes wonderfully. I think I might even prefer it frozen, as it gets a little crunchier. I may or may not have filled every remaining space in my luggage on my last return trip with popcorn. And I may have mocked my mom when she overnight mailed me a giant bag of it as a surprise, telling her how ridiculous it was to spend that much money on shipping popcorn. But secretly, I was thrilled. Anyway, this review isn't about that popcorn. 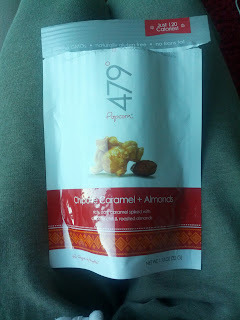 This is about 479°, a San Francisco based gourmet popcorn maker. They are local, but sell it packaged in regular retail locations. They have some savory and some sweet varieties, with fairly interesting flavors. Pimentòn de La Vera: "Smoky Spanish paprika with bursts of ripe organic tomato + onion." Tasting notes: Nice and spicy, liked. Vietnamesse Cinnamon Sugar: "Vietnamese cinnamon dusted with crunchy light sugar". Tasting notes: flavor too subtle, not very cinnamony or sugary. 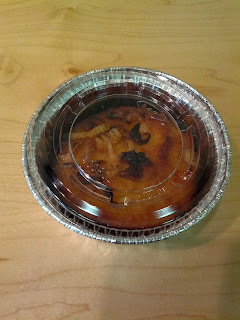 A few months ago, I visited After Osha to use my GoPago credits to try out their interesting desserts. I've been meaning to go back ever since, because their dessert selection is downright fascinating, like the Jade (pandan tapioca with kettle corn and coconut cream) I had on my last visit. I kept forgetting to return, until this past week, when I got a great surprise: a $10 GoPago credit to use just at After Osha! And, I had to use it within a few days, so I couldn't forget about it. Since I'm a dessert girl, and I really have not liked their cooked dishes, I mostly stuck with the desserts again. Plus, I can't get totally unique desserts like these elsewhere! They were again very strange. I love trying them mostly for the experience of eating something totally different, although next time, I'm tempted to just get the mango and sticky rice! Service was again friendly and eager. GoPago worked flawlessly. My big complaint is the packaging. After Osha is designed to be a take out place, and their containers don't stay closed! Both desserts I got had lids that fell off when I was carrying them home, making a big mess. And I wasn't being rough with them. Improvement needed in this area. Ruby Red: Water chestnut coated in tapioca served with coconut milk. $3.95. This one looked and sounded too crazy to not try. I was debating between a few choices, and the staff member I asked recommended this one, particularly for its uniqueness. And unique it was! I got a little hooked while eating this, in a "what on earth am I eating" sort of way. The bottom was the bright red liquid, filled with little balls. The balls looked soft, but when you bit into them, they were crunchy. These were the water chestnut pieces, wrapped in tapioca. The crunch was nice, the soft coating was a good contrast ... it kinda worked. I have no idea why it was red. Then, on top, was the coconut cream, along with some pieces of fresh young coconut. I loved the coconut cream. I'm not certain the flavors complimented the water chestnut that well, but I didn't really care, it was coconut after all. This was just weird. I still can't tell if I liked it or not, but I kept on eating it, so intrigued by it. I probably wouldn't get it again, but it really was fun to try. It reminded me a lot of the Jade, in that it was a crazy color, contained ingredients that I'd never expect in a dessert, and was just fascinating to eat. This was not at all what I was expecting. I forgot to write down the description, but I thought it said it was a pandan (or maybe coconut) custard, with taro. It looked a little solid to be what I'd think of as a custard, but I love custards, coconut, and taro, so I still forged ahead. And it was in the dessert section, so I thought it would be a sweet custard, particularly as Thai food tends to be sweet in the first place, even the main courses. Imagine my surprise when I took the first bite, and tasted ... onions. Yes, the fried things on top were onions. I thought they were fried taro or coconut. This was a savory dish, barely sweet at all. 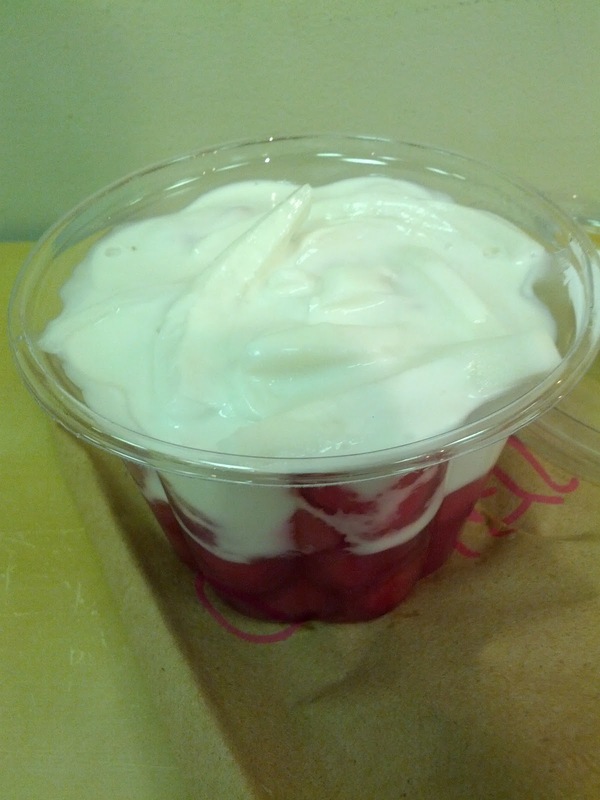 It also wasn't really a custard, it was very firm, more like a cake. It also seemed burnt on the sides and bottom. Vegetarian Crispy Roll: Silver noodles, dried mushroom, cabbage and carrot served with sweet & sour plum sauce. $1.50. I had a few more credits left after my desserts, so I got a little appetizer to enjoy before my desserts. It was a letdown. It was barely warm. The filling was predominately silver noodles that just really took over the entire thing. I didn't really get to taste or enjoy any of the vegetables. There was some decent spicing from salt and pepper, but it was pretty lost with all of the noodles. It was crispy, and greasy as expected. Not remarkable in any way. The dipping sauce was sweet and tasty. 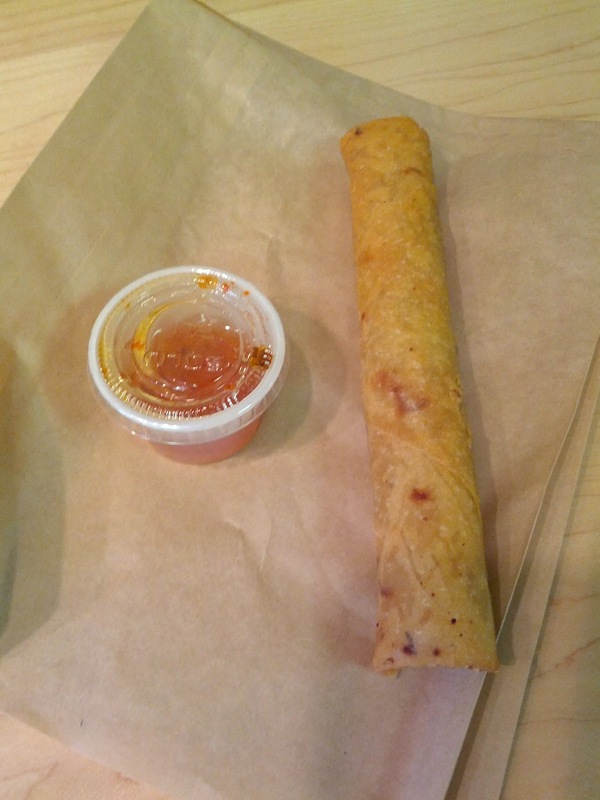 It was a large size, more like the size of 2 standard crispy rolls, which seemed generous for the $1.50 price tag. I would not get one again. 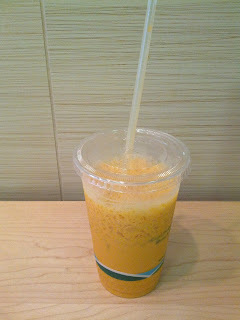 I had done my research in advance, and knew that they had a Yelp check-in offer for a free thai iced tea! I love thai iced tea, so this was very exciting! They serve it in a really non-standard way. They just give you a cup of crushed iced, and then over on the side are the dispensers of thai iced tea, thai iced coffee, american iced tea, etc. And then there is a dispenser of the sweetened condensed milk. This allows you to make it as sweet as you want. I've never seen this setup before, and really appreciated it, although I had absolutely no idea what ratio to start with! I discovered Rubio's a month or so ago, when I went to redeem my free birthday dinner coupon. I was impressed then by the quality of the food, the flavors, and the price point. Casual dining hadn't exactly been my style for quite a while, and it far exceeded my expectations, and reminded me that I can really enjoy more casual venues. Last week, I was invited to try out their new menu offering: tilapia tacos. Since I'd enjoyed my previous tacos, I was happy to go and try another one, even if I'm not crazy about tilapia. Like last time, the restaurant was not busy. I went at 5:30pm, and there was only one other customer. They had nice music playing, the space was clean, the staff friendly. In general, Rubio's seems very consistent. Even though this was a totally different taco, I had the same basic feeling when I left, that it was good, and I'll likely return. Like all of my other Rubio's tacos, it was served hot and fresh. The ingredients again all seemed pretty high quality. The flavors popped, particularly the sauces and seasonings. 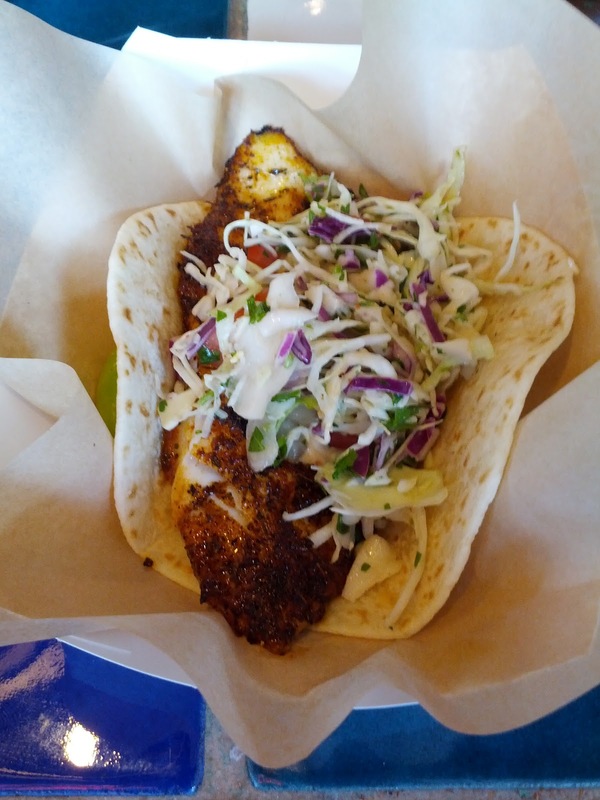 Regal Springs® Blackened Tilapia Taco. $3.59. I had the choice of a grilled tilapia or blackened tilapia taco. I asked the person taking my order for her recommendation, and she said the blackened one, no contest. I was already leading towards that one, so I went with her suggestion. It was described as "topped with creamy chipotle sauce, salsa fresca and serrano slaw. Served on a warm stone-ground corn tortilla and garnished with a slice of lime." Since I discovered in my previous visits that I greatly prefer their flour tortillas to the corn tortillas, I substituted the tortilla. There was no problem in doing so, and they seem pretty used to making substitutions. I actually somewhat regretted this decision, as it really didn't pair that well with the fish, but I think was probably happier with the substitution. The fish was a large piece, not at all fishy, very mild, a little flaky. It was moist and well cooked. Very decent, particularly for this price point. The blackening seasoning was the real draw to it, with some great flavor, particularly the salt level. It was dressed with a generous slather of the same delicious creamy chipotle sauce that I'd enjoyed on my Salsa Verde Pan-Seared Shrimp Taco before, and some salsa fresca, but there wasn't nearly enough of it. I would have really liked the additional flavor and freshness some more of the tomato based salsa would have brought. Salsa fresca is also not an option in their salsa bar, so I couldn't just add more on. I ended up adding some of the other salsas instead. The serrano slaw was the standout component. It was fresh and crispy, clearly not prepared hours in advance and just left to sit around. It had a really nice kick to it. I liked it a lot more than the plain cabbage or spring greens used in the other tacos. There was a lime on the side, that seemed like it had already been squeezed, as it had no juice in it, and it was rather mangled. It seems weird that they would squeeze it for me, and then leave it there like that. I'm not really sure what was up with that. The salsa bar also contains limes, so I took a fresh slice from there, and squeezed it on. The lime went really well with the blackening seasonings. By now, you know how I feel about Mondays. I only go out to dinner when there is an extra incentive to do so, like special themed prix fixe dinners! 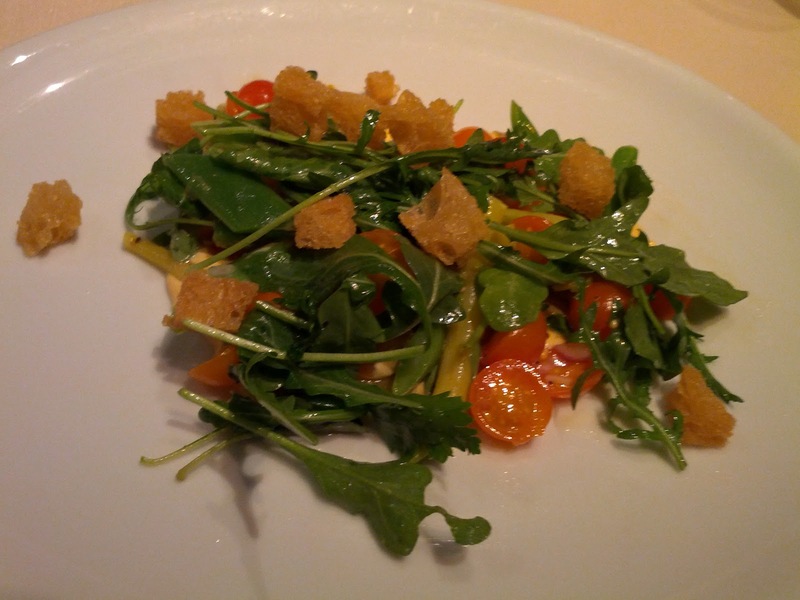 On Mondays, Jardinière does a 3 course prix fixe dinner, normally $49, including wine pairings. We attended one a few months ago when they held a Swedish dinner, in honor of Emil. We didn't love it, but it was a French restaurant trying to do Swedish food, so I've kept an eye on the upcoming menus, waiting for another one to spark my interest, to try it out again. I grew up on the east coast, and had just returned from visiting when I saw that Jardinière was going to host a classic New England Lobster Bake! The menu sounded awesome, particularly given the amazing lobster I'd had just a few days prior to reading it. I immediately sent out email to my dining group, and was able to gather a rather sizable group of 8. Since I've reviewed the restaurant before, I'll skip the general details, and just include a review of the dishes we had tonight, and any additional notes. Service was good, our main waiter was very friendly and personable, and dealt well with our large group, particularly as the night wore on, and the effects of the alcohol consumed started to show through. There were a few things that didn't flow all that smoothly, like empty glasses remaining on the table, plates not replaced between courses, that sort of thing, but nothing dramatic. The food was all fine, although not really that remarkable. I'm not sure I'll go back for another Monday night dinner, as they just haven't been that great. Perhaps if another menu really jumps out at me, but I'm starting to think it is better to just go when they are doing what they are known for, classic French cuisine. This prix fixe was $59 rather than the standard $49, presumably because of the lobster. Still a good deal given that it included the wines, although we didn't really like any of them. 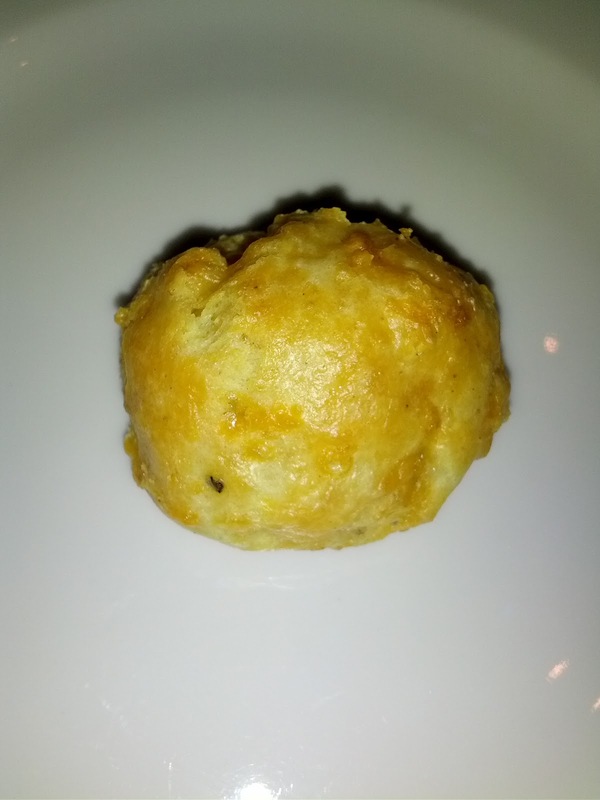 To start off, we were given a gougère. It was slightly warm. It had an ok cheese flavor, but really wasn't remarkable. It did conjure up the memory of the downright phenomenal one we had at Cyrus a few months ago, and made me drool in that one's memory. I'm not sure any gougère will ever compare. Same bread service we had last time. 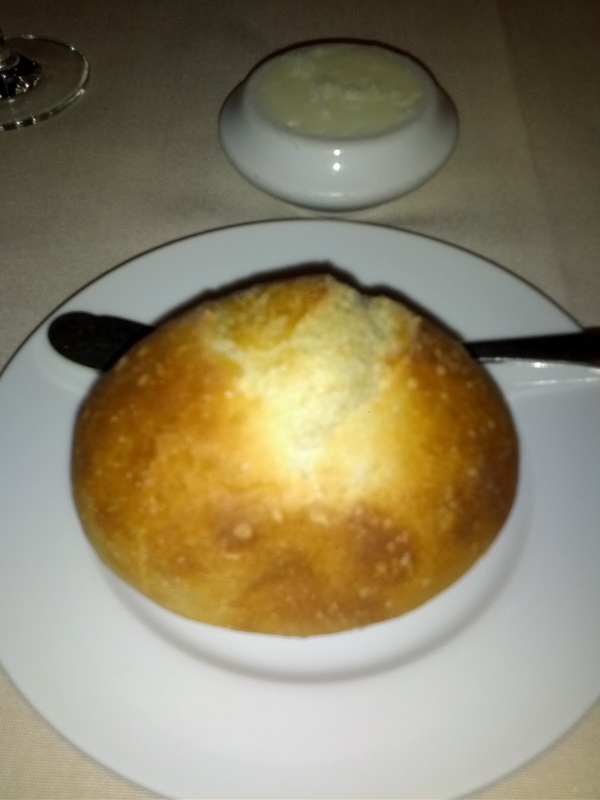 A warm crusty roll, served with butter with sea salt on top. The roll wasn't amazing, but I appreciated having it later on to soak up assorted sauces on my plate. As always, I liked the sea salt on the butter. Remember the Maine: Rye Whiskey, Carpano 'Antica Farmula', Cherry Herring, Absinthe Rinse. $10. Featured cocktail of the night. Very bitter, not really my thing, but Emil, who normally shies away from all cocktails, tolerated this. 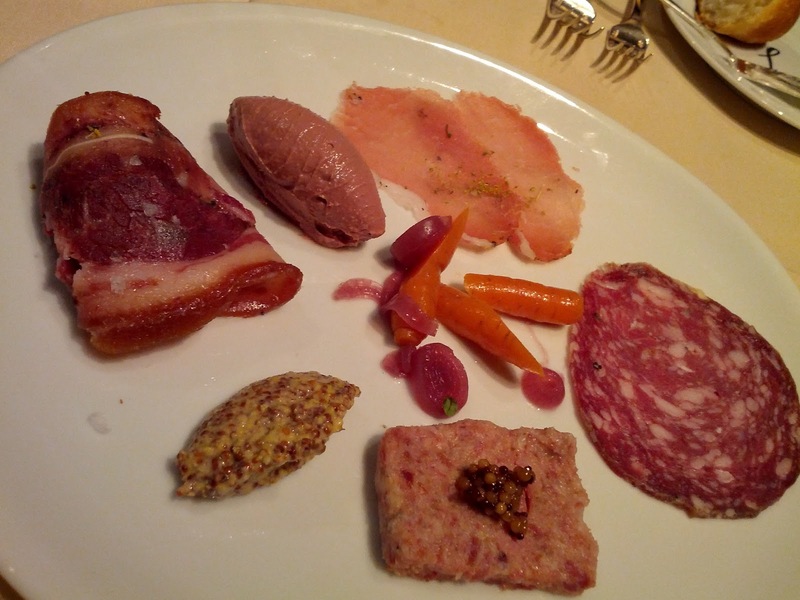 Charcuterie: ciccioli, tete de cochon, duck liver mousse, lonza, finnochiona. $18. Some of my dining companions decided we needed a few charcuterie platers before diving into our 3 course lobster feast. I knew the lobster bake was going to be more than enough food, and charcuterie isn't really my thing, so I mostly skipped this. But, there was a duck liver mousse, and I couldn't resist trying it, hoping to find something that reminded me a little bit of foie in there! It was very creamy, nicely salted, and ... livery. Not anything I'd rush back to get, but decent. I also tried the pickled carrots, because I love pickled things. These weren't remarkable. Flatbread and crostini for charcuterie. I didn't try the flatbread or crostini, but no one seemed to finish them, so I'm guessing they weren't a big hit. Garden Bean Salad, Sweet 100 Tomatoes, Wild Arugula and Lobster Aioli. The first course of the prix fixe. The quantities of the ingredients in this were not quite what you'd expect from reading the description, but it worked. The beans made up the majority of the salad, and there were three varieties: romano, gold wax, and hericot vert. All were very fresh and nicely crisp. The romanos had the best flavor, but there weren't too many of them, although there were far more than the hericot vert, of which I only got 2 pieces. The second most plentiful ingredient was the sweet 100 tomatoes. They were fantastic. Burting with flavor. Just tomatoes, but damn, when tomatoes are fresh and ripe, they can be so awesome. These reminded me of how very different tomatoes are when at their peak, compared to the sad excuses of what a fast food restaurant calls tomatoes in January. They shouldn't even be called by the same name! 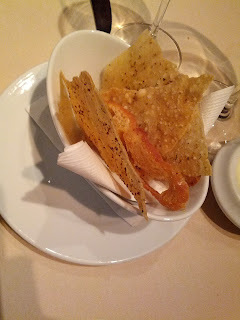 Next we had housemade croutons. These were super oily and crispy, slightly garlicky, and a little hard to stab with a fork, but quite tasty. There was also some wild arugula, kinda wilted from the dressing. Unlike a more traditional salad, the greens did not make up the majority of it. I wished they weren't there, as they weren't very fresh or crisp tasting, and it was a bit of a strange texture to have the wilty greens in there. Finally, we get to the lobster components. There was a lot of the lobster aioli on the plate. It really made no sense to me with the salad. It totally masked the amazing flavor of the tomatoes, was too thick and rich to be a dressing and overwhelmed the greens, and just didn't do anything for the beans. That all said, it was tasty, and I used some of my bread that I had wisely saved to dip in it, and that was really delicious. Even though there was a ton of it, I wiped the plate clean. So, the aioli was great, it just didn't work with this dish at all. I think it could have been really tasty in a lobster roll or something like that though. There were also a few tiny chunks of lobster in here, I think knuckle. My second favorite dish of the evening, although my top bite was probably a spoonful of these tomatoes! It was paired with Ostatu, Rioja Blanca, Rioja Alavesa, Spain 2011. The original menu had it paired with a Sauvignon Blanc, which I was looking forward too. I didn't really understand the pairing, the wine didn't seem to do anything for the dish. It was a little sharp and harsh for my liking, not sweet, and really not remarkable. Lobster Bake, Brentwood Corn, New Potatoes, Manilla Clams. 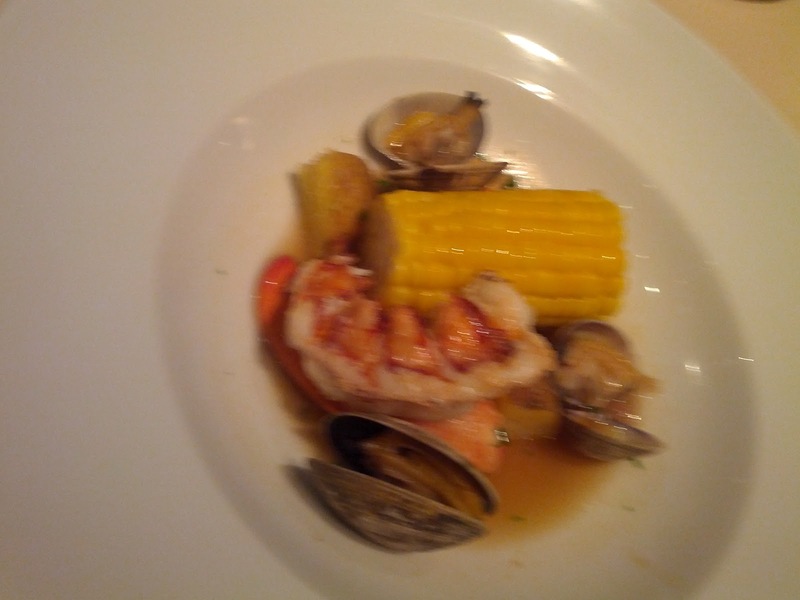 This was the main dish, the one we had come for: the lobster bake. For lobster, there was half a tail, a claw, and a few small chunks of knuckle. All were cooked decently, but I didn't find the flavor to really be there. I guess I'm spoiled from having east coast lobster. The claw tasted a little fishy and not very fresh, but the tail was fairly sweet. The corn was a little hard to deal with. No one really quite knew what to do. Did we pick it up and eat it like traditional corn on the cob? That is what I wanted to do, but it was covered in the broth and would make a big mess, and we were in a nice restaurant. Some at the table tried cutting the corn off the cob, which was also a bit of a mess. Anyway, it was just ok. Over-cooked for my liking. But again, I'm a spoiled corn snob, who grew up with a family that always got corn from the farm around the corner, and considered corn more than a few hours old not worth eating. The potatoes were just potatoes, but they soaked up the sauce nicely. There were also a few tiny pieces of soft flavorful onions that went really nicely with the potato, but not as well with the lobster. I'm not a clam person, so I didn't really like the clams, they were just ... clams to me. Meh. The broth was decently flavorful, and I enjoyed using the remainder of my roll to soak it up. This came paired with Les Héritiers du Comte Lafon, Mâcon-Villages, Burgundy, France 2011. It was sweeter than the first wine, with a slight bite to it. I didn't really like it. The menu originally had listed a chardonnay, which I was more excited for. Summer Berry Cobbler with Vanilla Creme. And finally ... dessert! The original menu had promised a blackberry cobbler with white peaches and creme angliase. I was definitely looking forward to this one, although, again, my family grew blackberries and ate blackberry desserts all summer long, so I'm guessing I would have been disappointed. The dessert was very similar to the one we had at the last dinner, in that it was a bit of a deconstruction of a classic dessert. Instead of blackberries, we had mixed summer berries: blueberries, strawberries, a few blackberries, and I think some plums. All were sweet, kinda mushy, a little gloopy, not remarkable. Something was off in the balance of ingredients here. This wasn't really a true cobbler, but did include little biscuits. They weren't what you'd expect to be good - they were not moist, they were very thin. But, they were soft, had a slight tang from some buttermilk, and big sugar cubes on top. I actually liked them. The vanilla creme was thick with a good vanilla flavor. 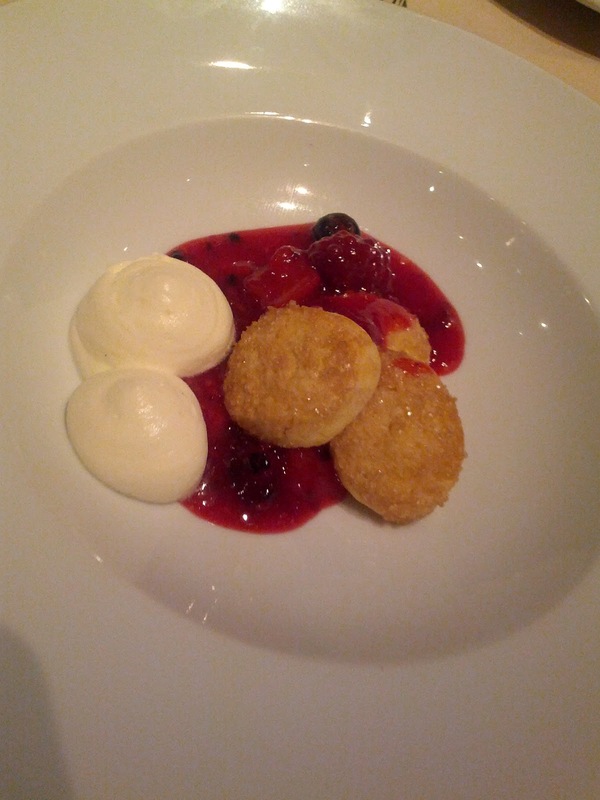 I enjoyed just eating the biscuits and creme, making this my favorite dish of the night, but it really wasn't remarkable. It came paired with Zeni, Moscato Rosa, Trentino, Italy 2007. No one at the table liked this, with most people taking a single sip and leaving the rest unfinished. It wasn't sweet, it wasn't caramelly, it just didn't have anything going on. Meh. Instead, we ordered a bottle of port. Yes, a full bottle. For 8 people, but not everyone was drinking. 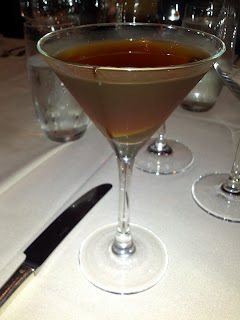 I didn't catch the name of it, but it was far better than any of the drink pairings we had. The same someone who ordered the charcuterie platter, and the bottle of port, also ordered a few cheese platters to go along with our dessert. I was beyond stuffed and didn't try any of the cheeses, nor write down what they were. But ... others seemed to enjoy them. 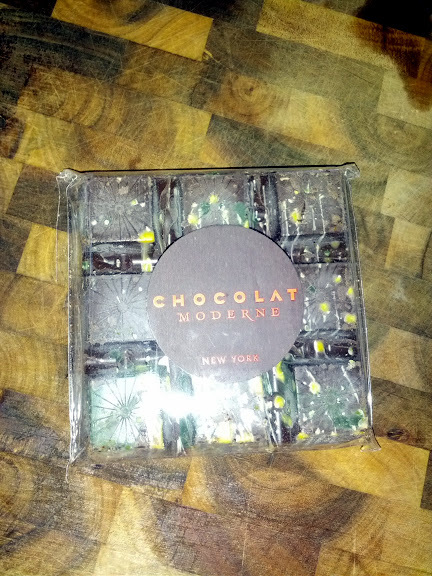 Chocolat Moderne is a small artisan chocolatier from New York. I discovered their products at my local chocolate shop, Fog City News, back when they ran weekly tastings. I've also purchased a few of their bars, as they have a number of insanely great sounding filled bars. The bars are quite the sight, with all different colors of chocolate "paint" splashed on them. The chocolate is high quality Valhrona couverture, 61%, and they handle it well. The flavors I've tried have all be fairly interesting. Tasting notes are below, as always, with subsequent tastings denoted in brackets. Blood Orange Bergamot Dark Chocolate Avant-Gaurd Bistro Bar: "Dark chocolate bar filled with caramel made with fresh blood orange juice and scented with oil of bergamot." Tasting notes: Nice dark chocolate filled with goeey orange flavored caramel, beautiful design on outside. Nice. Raspberry Rendez-vous Bistro Bar: "Dark truffle with raspberries". Tasting notes: Lots of berry flavor. Dark chocolate was unobtrusive - didn’t add or detract from the bar, was kinda just there, but clearly good quality. Avant-Guard Berries And Lavender Bistro Bar: "Dark chocolate bar filled with caramel made with fresh strawberry and raspberry purée and infused with oil of lavender." Tasting notes: Same thoughts on the chocolate, good quality but uninteresting. Nicely spiced, I got lots of cardamon notes.